Researchers exposed the right ear of 18 participants to LTE radio frequency radiation for 30 minutes. The absorbed amount of radiation in the brain was well within international (ICNIRP) cell phone legal limits and the source of the radiation was kept 1 cm from the ear. To eliminate study biases the researchers employed a double blind, crossover, randomized design, exposing participants to real and sham exposures. 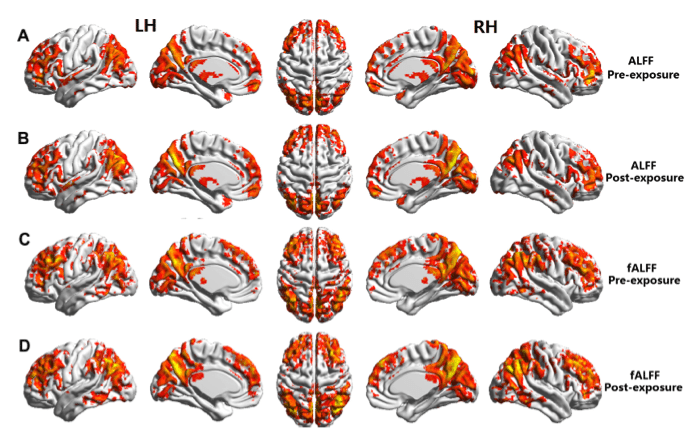 The resting state brain activity of each participant was measured by magnetic resonance imaging (fMRI) twice, once after exposure to LTE radio frequency radiation, and then again after a sham exposure. The results demonstrate that radio frequency radiation from LTE 4G technology affects brain neural activity in both the closer brain region and in the remote region, including the left hemisphere of the brain. This study is important for two reasons. Firstly because it is the first one to be carried out on the short-term effects of Long Term Evolution (LTE), fourth generation (4G) cell phone technology. Secondly, because of the rapid rate of adoption of this technology. According to the Global mobile Suppliers Association “LTE is the fastest developing mobile system technology ever”. The United States is the largest LTE market in the world. By March 2013 the global total of LTE subscriptions was already 91 million subscribers. Over half of these, 47 million, were American 4G subscribers. More research is needed on the effects of LTE and other forms of cell phone radiation but the evidence is already compelling. Many scientific and medical experts are sounding the alarm. 1 Bin Lv, Zhiye Chen, Tongning Wu, Qing Shao, Duo Yan, Lin Ma, Ke Lu, Yi Xie. The alteration of spontaneous low frequency oscillations caused by acute electromagnetic fields exposure. Clinical Neurophysiology. Published online 4 September 2013. 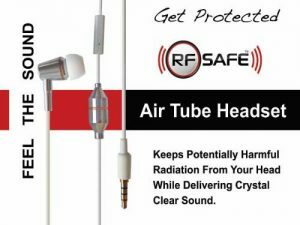 Consumers should utilize an air tube headset as a safer alternative to wired headsets or in-ear Bluetooth headsets, use the speaker feature and keep phones away from your body unless there is RF radiation shielding between the wireless device and cell phone users body. 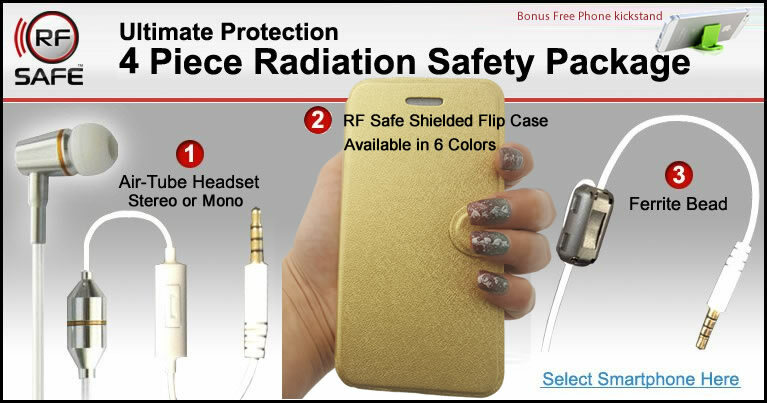 When carrying a phone on your body it’s highly recommended to use either an RF Safe flip cover radiation shielded phone case or pocket shield to deflect excessive radiation away. Don’t be mislead by a common misconception started in the 90′s that wired headsets, that the headset that came with your cell phone is a safe alternative to placing a phone to your head. This is simply not true at all! Ordinary headsets use a wire to deliver sound to an electronic earpiece that can deliver electromagnetic radiation into your head directly through your ear canal. RF SAFE HEADSETS PROTECT THE BRAIN! 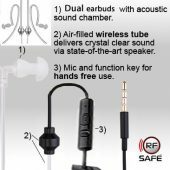 RF Safe headsets are an excellent, high quality-sounding product that delivers fantastic sound quality while eliminating the harmful radiation from reaching the brain. RF Safe Headsets allow users to enjoy listening music without electric components inside the ears – for completely safe radiation free sound only acoustic technology can deliver. 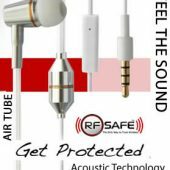 RF Safe’s patented Air-Tube Technology produces the world’s most durable, best sounding airtube headset on the market, so consumers can enjoy a live, on stage sound every-time a song is played through its acoustic sound chamber delivered through a sleek airtube design. Test have confirmed that wires used with ordinary headsets allow potentially harmful radiation to reach the brain of cellphone users. This potential radiation hazard is avoided when RF Safe headsets are used. 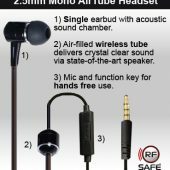 (Single Ear Bud) Mono Air tube headsets are perfect for private radiation free communication when your equal attention needs to be given to the world around you. RF Safe’s Air-tube Headset is available for all smartphone models in an array of colors to complement any healthy active lifestyle.